One can say that casino and all the gambling games are for our amusement; in some moments of life we really can even give money for such a relaxation, but it is true that among the walls of the money house there are lots of smart, wisdom and just skilled and experienced people, who are not criminals in reality, just want to apply their wit, stop rehearsing and start the first night in casino. How is it possible to predict the numbers and just all the gestures of the dealer? Maybe for somebody it's impossible, but for the gambling illusionists it's quite real and a great opportunity to prove themselves and maybe the whole world that they can and they do. In other words this roulette section cheating can be called the chip betting, because the swindlers, before the wagering, know the exact betting scheme: they do the earlier decided bets, colors and figures. They have counted even the dealers movements in order that a "mechanic" , the cheater-bet person could apply his sharpness to past pone the chips and that the croupier even doesn't recognize the smallest of the tricks of cheating at roulette. For example, the past posting movements are performed in the 3rd section of the roulette table, in which there are numbers from 25 to 36. Near this section there can be located the box in the left corner. 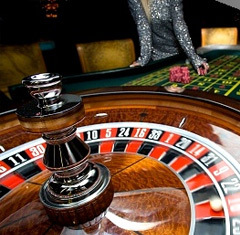 So, in this position the roulette bets are made, but only those which can be bought at the roulette table. Because it's considered that these chips don't have much value. So, each of the gambler decides which of the chips he wants to buy, but in accordance with the minimum amounts of the casino. The cheaters usually play with table minimum. The common rule is - to waste less and to take more. And in such a way every bettor has its specific bet and chips. So, the first bettor plays whatever chips which were from behind of the dealer. That is done to force the dealer move. The second one bet the black one, in order to make the camouflage to the black chip of 100$. The mechanic, the third cheater, pinches off these black chips from their primary position. To prevent the risk, that is generally made during the location of the bets on the numbers. So, these black chips have to be pushed into the 3rd section that the "claimer" could trigger in legal way that black straight ones. After the coming of the "floorman", the set-up is generally completed. So, as soon as the 3rd section numbers win, there begins the performance of movements. The claimer has to stand up near the 1st number section and to fake out the situation that he has touched the chips in order to provoke the suspicions. This is that right second where the eyes of the dealer moves from the layout and mechanic moves the dolly and exchange the chips. And this is it, the cheaters have done their shady transaction and happy with the winnings leave the casino. Everybody wishes to have so simply picture of grabbing the greatest payouts. But every time you have the maximum risk.